This is Part 2 of a two part series on the production of 2016 GPK Apple Pie. If you missed Part 1 you can go here to catch up. 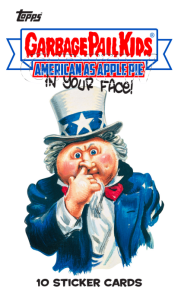 In the first post we looked at how many packs/boxes/cases were produced of 2016 Garbage Pail Kids As American as Apple Pie In Your Face. Here’s a review of what we came up with. I’ll be using these numbers to try to come up with an idea how many of each type of parallel and insert were created for the set. This will give you a good idea how rare a set is and how quickly you need to snap up that card for your rainbow! I’ll also compare some of this info to the 30th and previous sets for reference. As a reminder in addition to using the sell sheet and odds, we will also have to make some assumptions and flat out guesses when trying to figure some of these out. So how many of each type of card was made? We can’t figured it out for every type of insert or parallel. Some card types we don’t have enough information. Other times however, Topps is nice enough to tell us exactly how many of a card was produced. In fact Topps almost went out of their way to help us this time around. For the first time in a regular set Topps decided to number multiple parallel and insert types. This has been great news for collectors who have been asking for this for quite some time. This means we already know most of the parallel and insert numbers already! Makes this post a lot easier! We know Spit /99, Bloody /75, and Gold Dust /50 for the parallels, and Relics /99, Patches /50, Autos /25 for the insert sets! Thanks to Topps saying on the sell sheet directly we also know total sketches; Regular (2000), Die-cut (500), Panoramic (100), Loaded (250), and Duel Artist (100). Still there are some things we just can’t determine. Although with this set that number is very low. First off, the Pee Borders, we don’t have enough information to figure out how many of the retail packs were gravity packs. Since we don’t know the number of packs its impossible to determine how many of each Pee border was produced. Although compared to the Poop Border from the last series the odds are easier, and are falling at a greater rate. For this same reason we also can not figure out the print run of the Adam Bomb/Adam Boom special Blister cards. Again, because there is nothing to differentiate this retail pack from regular retail packs, we don’t have enough info. That’s really it! This is the most forthcoming Topps has been with information. I hope this trend continues. I want to start with the Bloody Borders, even we though we know how many were made. Because those are only found in Collector packs, that is one card type we can use to figure out print run. You notice I didn’t use it in Part 1, and here’s why. Let’s look at how many Collector Packs were created based on Bloody borders. 220 cards X 75 made per card = 16,500 total Bloody Borders X 3 odds = 49,500 total Collector packs. Whoa! Wait a minute….that can’t be right? Previously we used Patches, Relics, and Duel Artist Sketches and came up with 36,500 packs. So, why the difference? Here’s my thoughts on this, while busting my collector’s case, and in talking with other collectors, I realized these are falling at a much higher rate than the odds state. On average collectors are actually pulling 11 Bloody Borders per box, instead of the 8 they should be pulling. This is a 27.2% increase in pull rate. If we apply that same 27.2% increase to the number of packs we get 46,428 total Collector packs. We are still off by 3000, so its not perfect. But I do think this it explains why the odds don’t match for the Bloody borders. It makes sense, the new set was under ordered, so Topps printed less Collector packs than they anticipated. However, they decided to still include all the Bloody borders. While they would easily spread out the Spit and Gold Dust borders to other pack types, so its not as noticeable. Now lets figure out how many cards were made of the other parallels and insert sets. Bruised Borders – 36,500 Collector packs X 1 Odds (Doh) – 36,500 total Bruised borders / 220 cards in set = 165 per card. Puke Borders – 408,500 Retail packs X 1 Odds (Doh) – 408,500 total Puke borders / 220 cards in set = 1,856 per card. Comic Covers/Horror (Same info applies separately for each insert set) – 36,500 Collector packs + 39,000 Hobby packs = 75,500 total packs / 24 Odds = 3,145 total cards / 8 cards in set = 393 of each card made. Classic Patriots – 40,100 Jumbo packs X 2 cards per pack = 80,200 total cards / 18 cards in set = 4,455 per card. Gross Bears/Bathroom Buddies (Same info applies separately for each insert set) – 17,000 Blaster Boxes / 2 different types – 8,500 Blaster boxes each x 3 cards per box = 25,500 total cards / 6 cards in set = 4,250 per card of each type. How does this compare to the 30th set? For the Comic Covers and Horror stickers almost the same as Foreign Legion. The Foreign Legion set was larger at 10, so it works out to almost the same number. Green borders are down quite a lot compared to the 30th set, but it makes sense since production was down overall. Even though Bruised borders are not numbered they are still quite limited. Finally, we’ve never been able to figure out retail bonus cards before, but thanks to exclusive sketches found in Jumbo/Blaster packs we can. And the numbers show its a lot! You should have no problem putting together your cherished Bathroom Buddies insert set! There is another thing I found interesting when looking at the numbers. For the first time Topps really pumped up Collector boxes when it comes to printing plates and autos. Previously, Topps kept plate odds the same throughout all pack types. Because retail is 80% of the print run that meant most of the plates were in retail packs, sitting on shelves, not being opened. With the 2016 set however, Topps increased the plates odds for Collector packs, while leaving Retail/Hobby almost the same odds as the 30th set. We know Topps inserted 440 plates into the production, therefore we can figure out how many plates are in each pack type. The math looks close, that comes out to 441 total plates. There are only 190 Collector cases, so looking at the odds most of the cases will produce a plate. This is a big boom to collectors buying Collector boxes this time. This also will mean more plates should hit the market, a lot quicker than in previous sets, good for those collectors looking for their character. On the flip side, poor Hobby boxes. Topps gave Hobby the shaft with this release. Don’t except a plate when busting Hobby boxes. Topps did the same thing with artist autographs, the odds are much better in Collector packs than Hobby/Retail. When you really dig into the 2016 GPK Apple set numbers it appears Topps made it much more accessible for collectors to collect their favorite character or parallel set. Topps decided to shy away from those almost impossible sets, Silver, Pink, Sepia, etc. Topps also cut way back on the number of insert sets and even parallel sets in this release, something collectors have also been asking for. Only time will tell if this will increase purchases with GPK collectors, and more importantly will Topps continue a similar lineup in their next set. Base Cards – (36,500 Collector packs X 4 cards per pack) + (39,000 Hobby packs X 9.5 cards per pack) + (408,500 Retail packs X 9 cards per pack) = 4,193,000 Total Base Cards produced / 220 cards per set = 19,059 Total of each base card. Hurry get your base set now before they disappear!!! This entry was posted in 2016 GPK Pie, Odds and tagged 2016 GPK Pie, Odds by Jeff. Bookmark the permalink. Nice work Jeff! Thanks for this!! !